Jim is head monkey here at Giveaway Jungle and loves searching the Internet for the best giveaways worth at least a hundred bucks. He posts the giveaways on the site as well as writes the weekly blog posts helping you get the most out of your giveaway time! We should just start calling ourselves iPad Mini Giveaway Jungle given how many times we feature the diminutive tablet. This time, we feature a giveaway from DiscountMags.com, where you can (duh!) find discount magazine subscriptions, and they are giving away two iPad Mini tablets. The giveaway is as simple as they come – sign up to their newsletter through a Rafflecopter widget and then wait to see if you win. This entry was posted in Giveaway on May 15, 2013 by Jim. Giveaway site Holiday Contest and Sweeps is participating in an Ergo Chef Cather’s Day Giveaway with a handful of other blogs and the main (and only) prize is a $100 Amazon Gift Card. In the post there’s also a discount code if you want to purchase Ergo Chef products but that’s not necessary to win. As you’d expect from a giveaway of this size with so many co-hosts, there are 175 entries for all the usual social media things. This entry was posted in Giveaway and tagged United States on May 14, 2013 by Jim. Another day, another iPad Mini to win! This time, we have Simply Gluten-Free to thank for this great giveaway and entry is simple – just enter your name and email. Share the giveaway link on Facebook, Twitter, and submit. You can enter three times daily – simple!. This entry was posted in Giveaway and tagged United States on May 13, 2013 by Jim. Wrapped is giving away a brand new silver or white 16GB iPad Mini with Wi-Fi in celebration of their new iOS app. It’s a photo app with a twist – your photos are wrapped and your recipients swipe their fingers to “unwrap” them. Cute idea for sharing photos. Giveaway is through the Rafflecopter widget, required entry is liking them on Facebook along with several other options. Contest Deadline: May 14th, 2013 Restrictions: United States, 18+. This entry was posted in Giveaway and tagged United States on May 10, 2013 by Jim. My So Called Balanced Life is holding a “Super Grad” giveaway event sponsored by Tip Hero and managed through a PromoSimple form. There are a staggering 130 entries but you have until May 21st to do them all. This entry was posted in General on May 9, 2013 by Jim. Jim Henson’s Sid the Science Kid is giving away an iPad (doesn’t say which model), a Sid’s Slide to the Side app, and a Sid the Science Kid DVD to one lucky winner chosen at the end of the month. Entry is via Punchtab widget and you only need your name and email. An extra 9 entries for the usual social media items. This entry was posted in Giveaway and tagged United States on May 8, 2013 by Jim. Giveaway Promote has paired up with Budget Earth and A Spectacled Owl to give away one KitchenAid Classic Plus Tilt-Head 4-1/2-Quart Stand Mixer in White valued at $273 (you can currently purchase one of these from Amazon.com for that price). It’s billed as a “Kitchenaid Mother’s Day Giveaway Event” and my guess is that Kitchenaid is a sponsor and giving away one of these awesome mixers. We have one in our home and it’s fantastic. Managed by a Rafflecopter widget and there are 120 entries for following a million different blogs, Twitter handles, etc. Restrictions: United States & Canada, 18+. This entry was posted in Giveaway and tagged Canada, United States on May 7, 2013 by Jim. Meremade, a craft and family blog written by Jennifer Clark, is giving away one hundred movies. That’s right. A hundred. They’re part of the Best of Warner Bros. 100 Film Collection and they have a retail value of $597, though you can find it for less than $400. It includes 22 Best Picture winners as well as basically every famous WB movie ever made. To enter, simply follow the blog and then fill out the Perfect Mother’s Day Fill-in-the-Blank Sheet in the comments. Good luck! This entry was posted in Giveaway and tagged United States on May 6, 2013 by Jim. 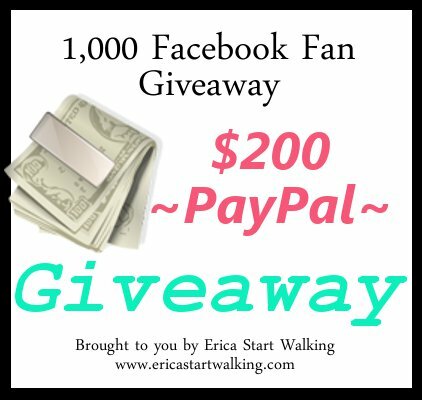 Erica Start Walking has reached 1,000 Facebook Fans and in return she has decided to giveaway $200 in PayPal cash to one lucky winner. Giveaway will be open May 3, 2013 to June 3, 2013. One winner will be chosen and e-mailed directly by Erica when giveaway is over. This giveaway is open world wide. Winner must be 18 years of age to win. This entry was posted in Giveaway and tagged United States on May 3, 2013 by Jim. Roasted Beanz is giving away a brand new Keurig Vue V500, valued at $170, for one lucky winner and does so courtesy of four co-hosts to this great giveaway. A short entry form, and all the other entrants, is all that stands in the way. There are several ways to enter and so far there aren’t that many entrants.